Denise Juneau is running as a Democrat for Montana’s lone seat in Congress. Juneau was elected to her current position as Superintendent of Montana’s Office of Public Instruction in 2008. She was narrowly re-elected in 2012. She says the experience as an elected executive branch official qualifies her to serve in the U.S. House. After officially filing her candidacy with Montana’s Secretary of State office late last week, Juneau briefly sat down with Montana Public Radio to talk about her campaign. Corin Cates-Carney: "You announced your filing in front of the Jeannette Rankin statue; it seems you’re running a campaign on a lot of firsts - first native women, first women in a long time, first openly gay candidate. Do think those firsts are going to help you or hurt you?" An area where Juneau’s record isn’t as comprehensive as her opponent is in the topic of foreign affairs. Zinke is a former U.S. Navy SEAL with international commanding and operation experience. Here’s what Juneau said on her outlook on foreign policy. CCC: "How effective do you think you will be as a freshman Congresswoman? You are promising change, but what do you think you can do?" DJ: “Well, here is what I do know, as a elected official you can get a lot done in this state. And even though we have one voice for one million Montanans, that voice should be one that reflects Montana values. I know what one elected official can do. I’ve done it as state Superintendent. You can get things done in-state. And this position goes back to Washington D.C. and you’re one of 435 positions. But what you can do there is look out for rural America. Look out for rural Montana. And make sure that voice is ever-present in whatever federal policy is being created. But when you come home you can do constituency services. You make sure individuals are looked out for and you can provide those. I think that is something I have a proven record on and I don’t think my opponent is doing that job right now. CCC: "If you were elected you would be serving under a new president. How do you think you would serve under what could be a Republican nomination of Donald Trump?" DJ: "Well, thank God for different branches of government, because going back as the U.S. Representative, I’m serving in the legislative branch. And that really is the beauty of the constitutional tensions between the different branches of government. Each of those has a job to do. And whoever the executive happens to be, as the elected representative to the U.S. House from Montana, I am going to my do very best to make sure the voices of Montanans are carried to Washington in whatever policy we are looking at and bring that voice of reason, bring that idea that we can do compromise, that we can collaborate and still get things done in this state, and take that voice to D.C. We could use more Montana reasonable voices in D.C."
Juneau is running against Republican Ryan Zinke for Montana’s seat in the U.S. House of Representatives. On this episode of "Campaign Beat" we talk about the Bullock and Juneau filings and likely campaign themes in their races; the many Republican legislative primary challenges (moderates v. conservatives within the party); and the anti-hate rallies held this week. Democratic Superintendent of Public Instruction Denise Juneau rallied support at the Capitol today as she filed her bid for Montana’s lone U.S. House seat. Democratic U-S House candidate Denise Juneau kicked off her jobs tour today in Billings. Juneau is currently the state school superintendent. 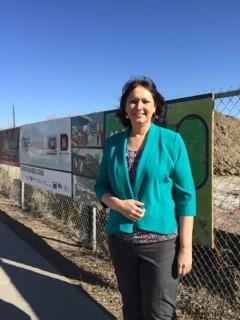 She made her announcement in front of Medicine Crow Middle School, which is under construction. “What better place than a construction site that’s actually building infrastructure for the community where students can learn,” she says. Juneau says education and workforce training will prepare the workers of tomorrow. She wants them to be able to earn a living wage and raise their families in Montana.